Is there anything kids love more than iPods?! 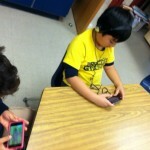 Here in first grade, we are using old and used Ipods as learning tools. After downloading FCPS approved apps, the children are able to practice sight words, letter formation, and math facts. They can listen to stories and interact with them. What an amazing and interactive tool for educators to remediate and extend students independently! Ms. Davis’ class engaged with iPods to enhance the learning process! Freshmen in college? Nope. 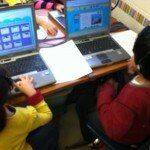 Just 1st graders surfing online for their research project!